Making backup of a WordPress blog is always easy but if you want to restore the same backup,then it is no easy task,especially for the people who are less accustomed to these things. I recently had to restore my site due to a hosting problem and was left wanting for a good tutorial to do so, but there are no detailed tutorials on the web in this regard. 1. 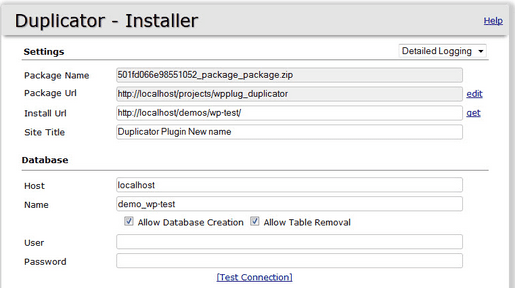 First install Duplicator Plugin on your WordPress Blog. 3. Now change your name-servers to point to you new hosting account and till it propagates across the web, go to your new cPanel X and go to my sql databases and create a new database, say for this tutorial we assume it to be database_1. Then create a new user , say user_1, and add this user to the users of the database_1 and give all permissions to this user,and remember the user_1's password for future reference. 4. Open restore script installer.php by opening URL example.com/installer.php in your browser and wait for the script to load properly, now you will see a form,the data entered here has to be correct for your blog to function correctly, so be careful. 5. Now on the user and password fields enter the user_1 and its password which you had created in step 3. 6. In the Database name field enter the name of the database which you had created in step 3 i.e. the database_1, and you may even click on the test connection button to test if the database and password of the user_1 are matching perfectly. 7. Tick the check box Database Creation and if you are getting problems you can even tick the Table Removal option too. 8. This is the final step in process, check all the data entered and click on the final deployment or restore button, after this the process will finish after some time depending on the size of the backup size. 9. Check the process and then delete the installer.php etc. files which are given in the instructions. So, hopefully you would be done by now, if you are happy with this post then you may check out our other articles too here, if you have some other problems then comment below. Good tutorial and excellent writing.. Thanks for Reading through .. I should bookmark this. Really useful article. Thanks for your article. Does duplicator rename all the asset URLs? E.g. if I have a link to a PDF such as http://www.testdomain.com/.../1.pdf would that be converted to http://www.livedomain.com/.../1.pdf after running the installer? Being able to take advantage of new WordPress plugins,Premium Wordpress Themes Cheap features and themes will ensure your blog is always on the cutting edge of technology. Due to some hacking attacks and viruses, we must keep a daily backup for our websites to recover it after losing, I have also found the list of best WordPress backup plugins, , Here's the guide which helped me in the daily backup. Thanks for sharing this post.